Angers Trucking has been delivering merchandise in the New England area for it's customers located throughout the U.S., since 1980. Whether it's palletized freight, small package delivery, commercial or residential deliveries, Angers Trucking, Inc. has 40 to 50 vehicles and drivers, delivering throughout New England on a daily basis. 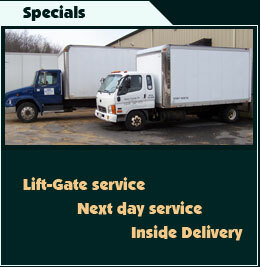 Overnight delivery is the specialty and it is done at the most affordable rates you will find.